The central door locking switch is located on the driver’s arm rest. It is operated by depressing the door lock switch. If any door is open when the switch is depressed, the door will remain locked when closed. 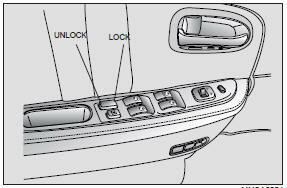 When pushing the front portion of the driver’s door lock switch, all vehicle doors will lock. When pushing the rear portion of the switch, all vehicle doors will unlock. The door ajar warning light will illuminate when a door is not fully closed. Close the door completely and the light will go out.